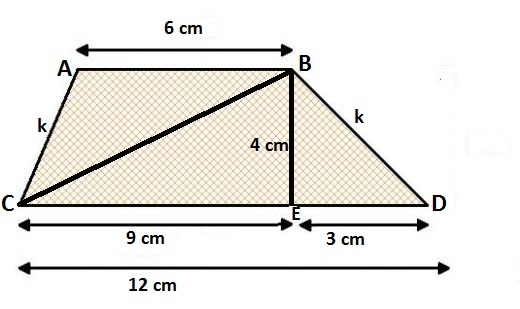 How to find the length of diagonal of an Isosceles Trapezium? 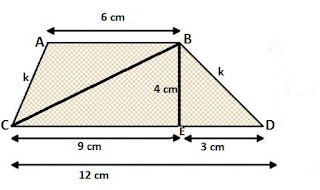 In SSC CGL Tier-2 2015, A question based on Trapezium was asked where it was required to find the Diagonal of an Isosceles Trapezium. Many students mailed us the same question and requested to provide the concept behind that and also the solution. In this post, We are providing you the concept along with few questions based on that. At the end, We are providing the same question. I hope you would be able to solve that question. Anyway, let's move ahead. Have a look on below given image. It's an Isosceles Trapezium having equal sides AC & BD and parallel sides AB & CD. 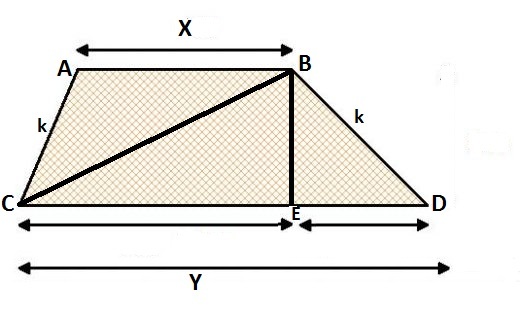 Let the length of AB be X and the length of CD be Y where Y>X. BE is the height of the trapezium. You need to find the length of BD. So, How will you find? ED = (Y - X)/2 . Now, you have the length of ED so you can easily find the length of CE. Height BE = 4 cm. Questions for Practice- Can you solve this? What's your answer? Comment! . If you are still not able to solve this question, Inform us via comments. We will provide you the solution as well.